Taryn Elise has nothing but praise for famous YouTuber Jeffree Star's makeup after her lipstick survived a scary and unfortunate car accident. Finding great cosmetics that don't cost an arm and a leg is tough, especially if you wear makeup every day. It's a catch-22, too, because you don't want to spend a lot of money, but the more you spend, the longer lasting and better quality a product tends to be. 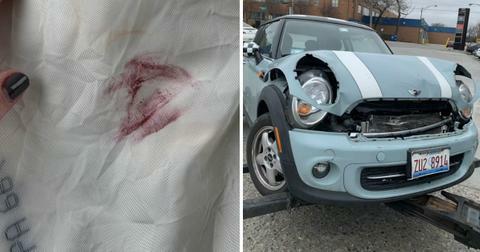 Taryn's lipstick fared better than her car in this accident. 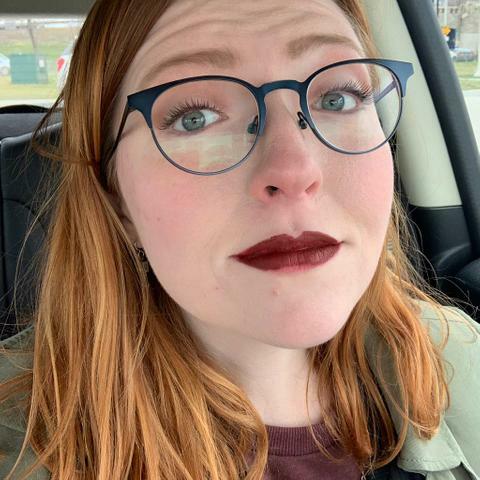 She gave a glowing review of Star's lipstick, and showed off just how well it stood up in the aftermath of the accident. 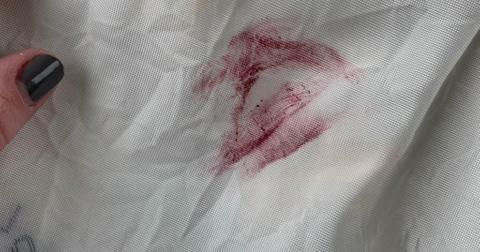 You might be asking yourself what the big deal is — it's not like anyone in the history of car crashes had the lipstick ripped from their lips during a crash — unless their actual lips were ripped off by scraping against the pavement somehow. 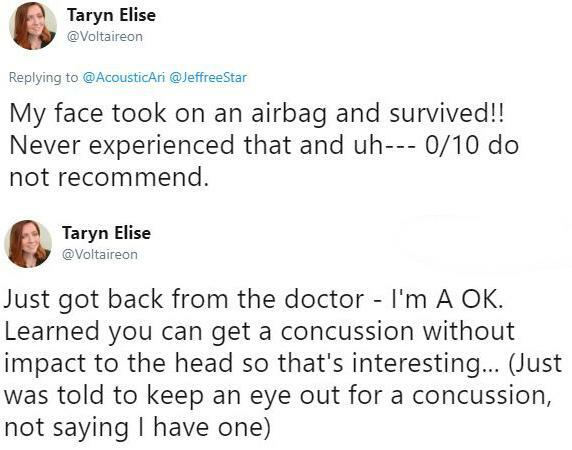 But when Taryn's airbag deployed, it smacked her in the face. 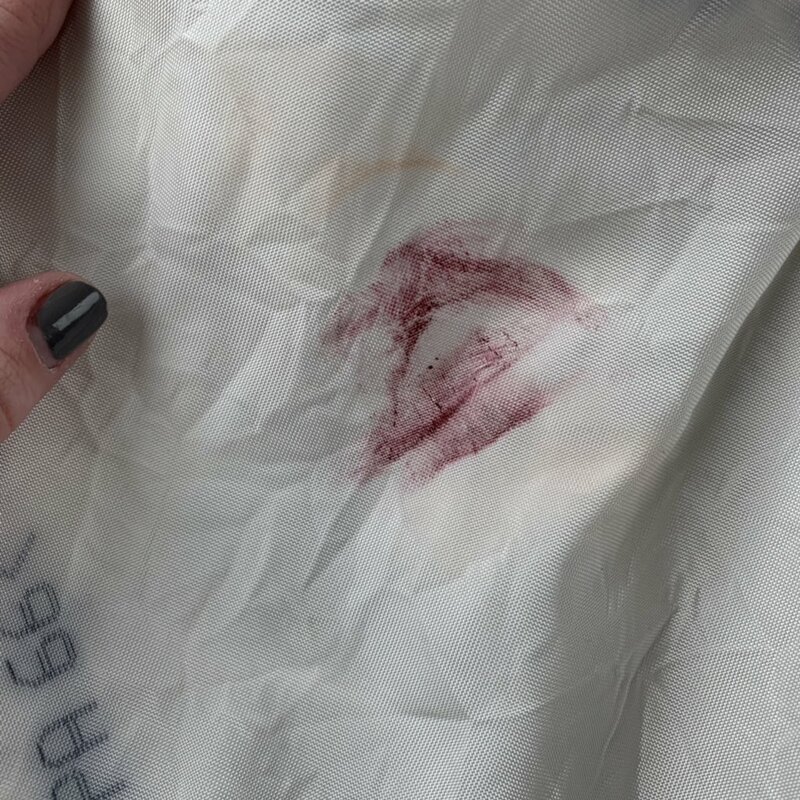 Some of the makeup did come off on the bag, and she's got the photograph to prove it. She also has a photo of the damage done to the car. It wasn't pretty. 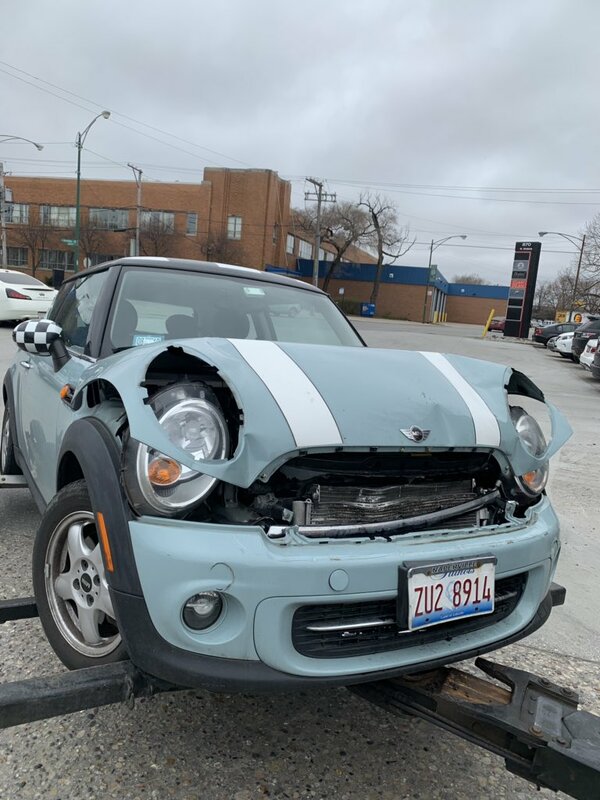 Her poor little Mini Cooper looks like it's permanently surprised. Maybe because it just found out that Charlize Theron will never be in another Italian Job film with Mark Wahlberg? Or, you know, it could be the car accident. So how did her lipstick fare in the wake of all this drama? Boom! That's right, barely needs any touching up. That's how well Jeffree's stuff stacks up. People were shocked at the lipstick's resilience. Note: if you're unfamiliar with Jeffree, this is pretty much the best GIF to represent what he's all about. Other people used Taryn's tweet as an opportunity to tell wonderful jokes. Good puns are always in order, even if they're about car crashes. Thankfully, the joke wasn't in poor taste, since Taryn was fine after the accident — thanks possibly to her airbag deploying and the fact she was wearing her seatbelt. Still, people wanted to know how in the world her whole face, not just the lipstick, was able to withstand the airbag assault. While Taryn didn't really have an answer for it, she did have some words of advice for anyone else who planned on getting into a car accident: don't do it. I'm going to chalk up her makeup victory to the fact that she used some high-quality cosmetics that don't rub off even in the most extreme of circumstances. Taryn's review of Star's makeup isn't the only unconventional cosmetics review on the internet. There was this glowing endorsement of Kat Von D's Tattoo eyeliner, which apparently stayed on even in the wake of a terrible accident. 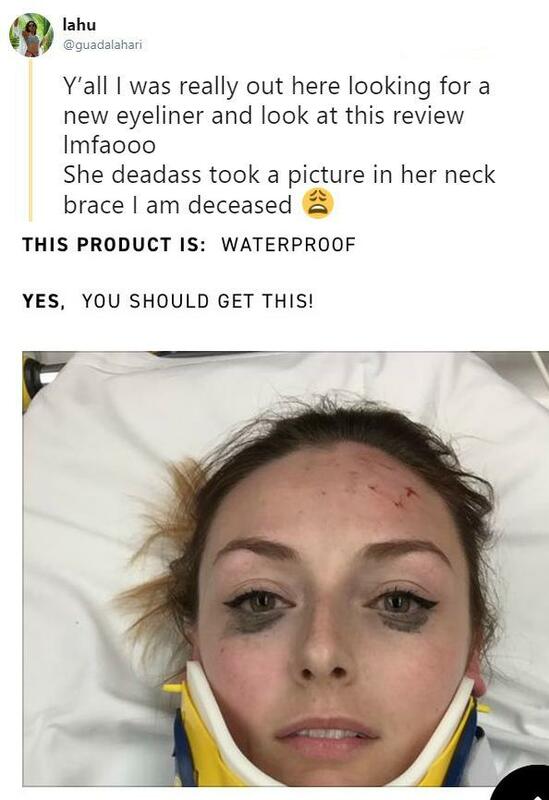 This young woman snapped a selfie while rocking a neck brace to show how well the eyeliner stayed on her face, despite the trauma she just endured. It seems like mascara reviews and crashes are kind of a thing. There was this customer who swerved right into a cement pole and wept about it all the way home (as one does). While this person's driving skills may have let them down, their eye makeup did not. Some of the products were tested in hopefully more typical scenarios. 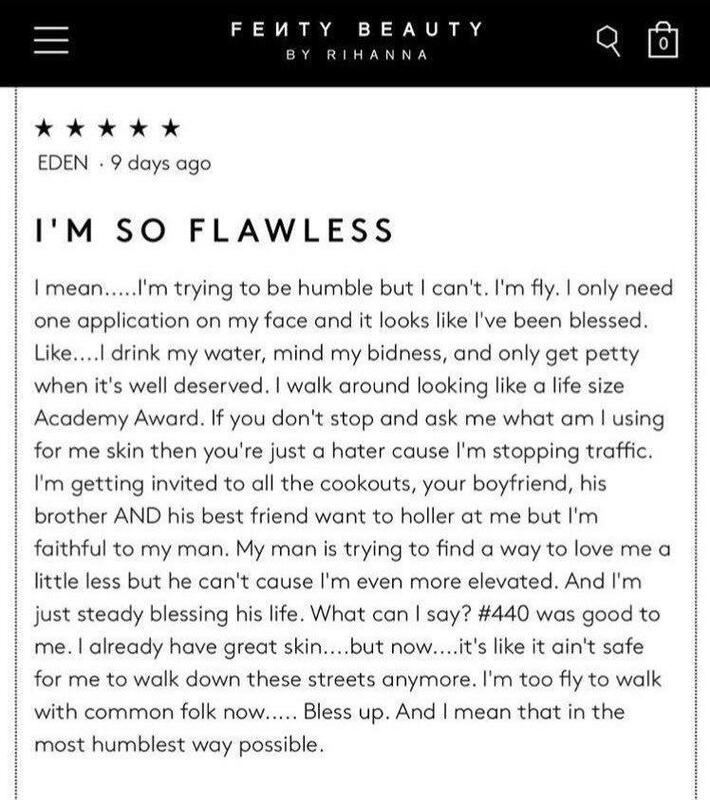 Like this woman who had nothing but good things to say about this Fenty Beauty product that lasted through an entire date of sweating and sloppy kissing. 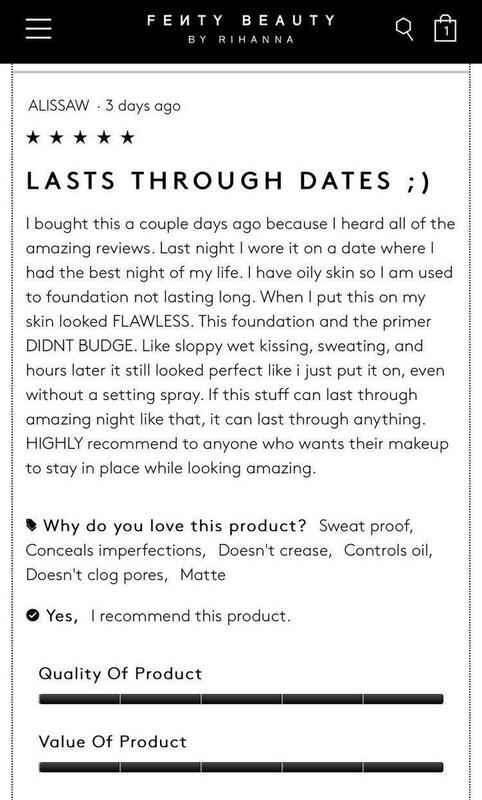 Honestly, wet face sucking is probably the true litmus test for any cosmetic. It's important to look good even when things look bleak. 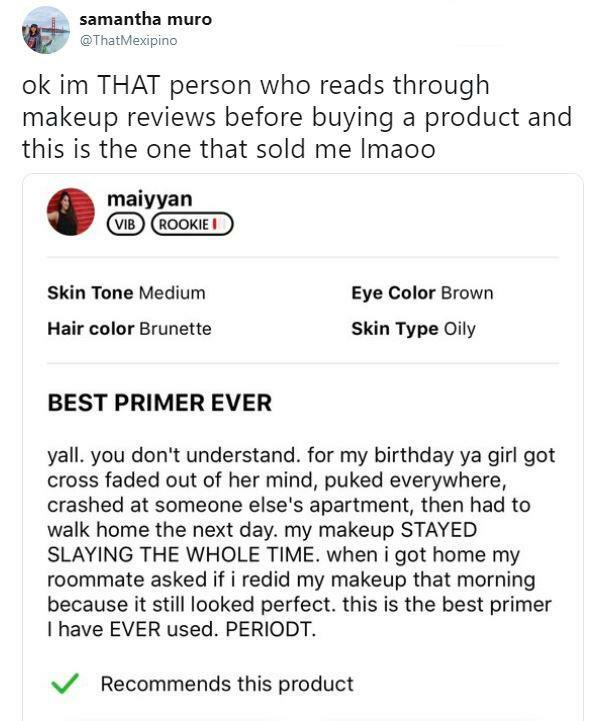 Like this person who had nothing but good things to say about this primer for Sephora. Their long-time boyfriend might've cheated on them, but at least they're going to look good crying about it as they cut up photos of him and end up partying/sleeping with a stranger. Eden loved her Fenty makeup so much that she attained a new level of gorgeousness only reserved for the gods. She won't steal your man, but you should know that she totally could if she wanted to. Puking. Sleeping at another person's place, waking up to do it all over again. This young lady managed to have the kind of day that ends in a walk of shame, only she looked like she just applied a full face of makeup. That's how good this primer is. Honestly, after reading this review, I'm probably going to get this exact kind before I get turnt. This one isn't so much a review of makeup as it is a review of Ron Perlman. 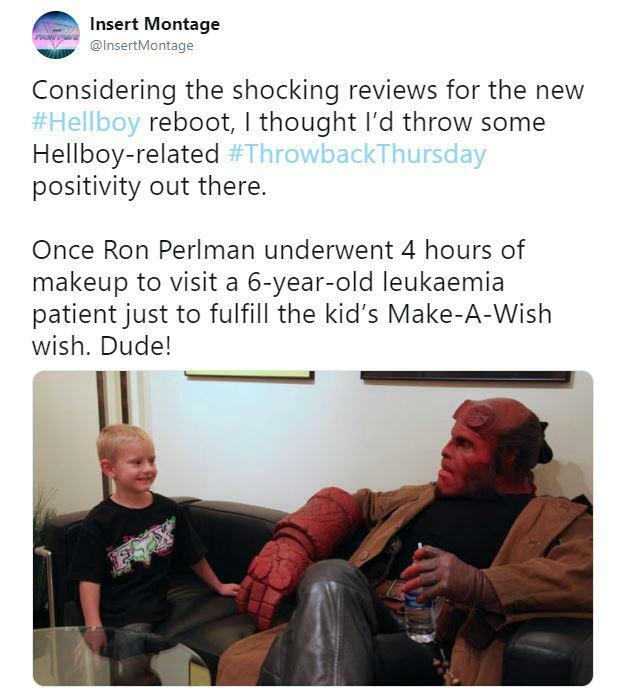 But the fact that the actor sat in four hours of the makeup in order to make a kid's wish come true is pretty darn awesome. 10/10 would recommend the red color palette that Ron was wearing as it made a child extremely happy.